Stu's Fly Shop & Stu's Superior Flies: Sage Fly Rod Deals, $1 dollar flies, Big NZ trout story, Convert you takes, Stu's fly shop NZ rocks! Sage Fly Rod Deals, $1 dollar flies, Big NZ trout story, Convert you takes, Stu's fly shop NZ rocks! THE TROUT AT THE MOMENT!! The trout are happy at the moment because the rivers are clear and every one that i have seen have been nice and fat. Already i´m seeing plenty of fish starting to pair up and gathering in the pools as they sort out who they want to make love too and then venture to the spawning grounds of choice. It is from now on that quite a few of the fish caught will start to color up and have more prominent colored spots and a nice golden color. These are always great fish to photograph if you are lucky enough to catch one. If you find them in holding pools you will be able to generally make multi-able casts to them as they tend not to spook as easily as solitary fish. 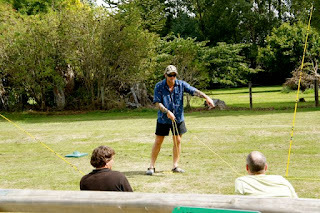 Though eventually they will know you are there and will ignore most offerings - as always get that first presentation right, light tippet and a drag free drift. THE FISHING, Convert Your Chances. 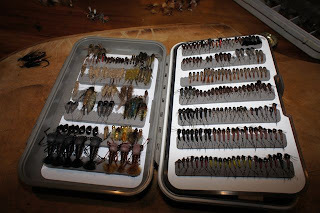 This is a photo of a guru fly fishing gent from Europe - He knows what flies and hooks work and hold =NZ trout- thats why he has mainly Stu's Superior flies in his box- even though he is also a fly tier! The fishing has been a wee bit tough this March. I was out guiding the other day and my dad was chatting in the shop to another well known pro- guide who had been with two clients for 3 x full days and the clients had not caught a fish, although the guide managed one. Which if i know him well enough it would have been on a spin rod! :) This was probably due to the unusual weather patterns we are having and the wind and freezing winds would not have helped. I also have been out guiding/teaching and most days locally have still managed to get my clients onto fish but not easily. For success here as you know you need to be able to convert any chance you have. So if you get one chance - convert it and you will catch fish most days even on tough days (maybe). 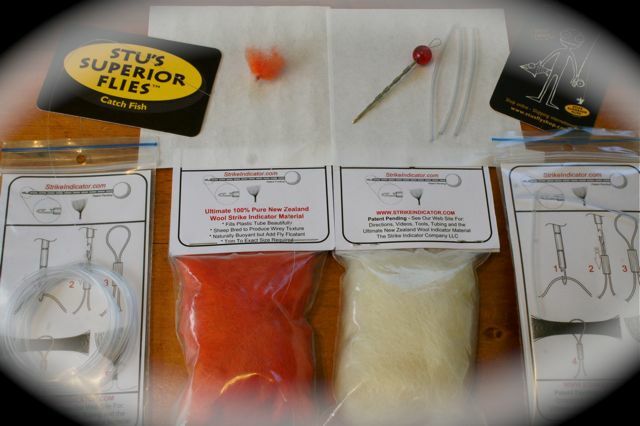 You need this indicator - set to catch more fish, see the webshop for this new great product! At the moment there are still some dates in April, pretty much the last month of the season here in Southland for the best rivers and brown trout fishing in clear upper reaches water. 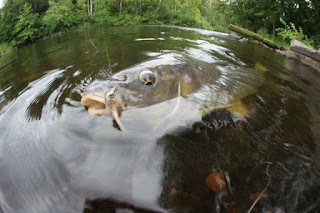 This can be a month of great fishing and looking at the weather pattern it looks like the sun is on its way - at last. 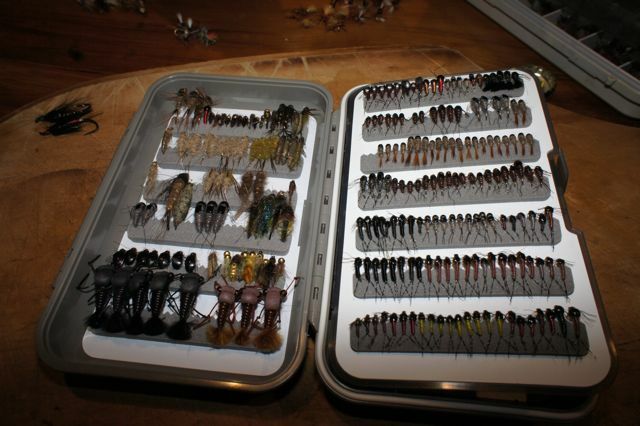 It´s a month when the may fly hatches can fire and maybe my favorite month for fishing. So if your interested in catching some nice big brown trout, hopefully on small dry may fly imitations send me an email and i´ll book you in before it´s too late. I have also availability for some casting lessons and some of my NZ fly fishing schools as well. 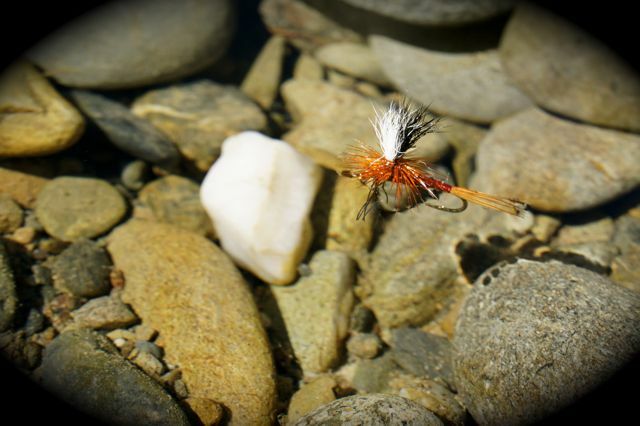 Using the best materials and design i can get my parachute mayflies to sit perfect in the waters surface , here is a photo of my hi-viz mayfly designon the surface of the water in a NZ gin clear stream. Check out the clearance section of my online shop for those winter bargains! A wee FISH Story & A BIG FISH STORY - all in one!! Mark a client, told me this wee story the other day. He spotted a nice big brown in the Twizel area in a big pool. He cast one of my deadly cicadas over it and up it came and engulfed the fly. After a wee battle he landed the nice big brown, as he was about to remove the fly he noticed another smaller trout hanging out of its mouth. The big trout that took his fly must have just chased down and snaffled this 8 inch trout and although he had just taken that fish he still wanted the Stus Deadly NZ Cicada. Realizing that the smaller trout was alive Mark pulled it from the big trouts jaws and revived it. It looked pretty healthy but stunned. He sat the smaller trout in front of him in the water to come to its senses. He then removed the cicada and let the big tout go from the net back into the clear water of the pool. Within seconds the big trout swam straight back towards him and grabbed the small trout and took off with it. Because it was clear water, Mark could easily see it was the same big trout !! SAGE FLY ROD DEALS- 9wgt-7wgt-6wgt Sage specials- end of season. Check out the deal i have on the 7wgt and 9wgt rods, and if you are looking for a light Sage spey rod check out the offer on one only- Z-axis spey rod- great for the north island, salmon fishing etc. Also i have only two left on special TCX 6 wgt Sage rods. THE SHOP - Tourist numbers 30% down. The shop was busy for Feb as usual but now days George is getting bored as most days he is now getting about 5 customers a day which is well down for March- seems the tourist numbers are all down about 30% - which is not good for the shop and for all other tourist reliant businesses- but that means that there is hardly anybody out there fishing, so there is no shortage of water to fish! Great as well for me guiding and my clients. Remember the shop will be closing in 5 weeks time so best stock up before i have to close doors for the winter. Oh! The Dream team!! Dad, Mum and Ela say hello to you all and thank you for all the comments, photos and fun emails so far this season they have all received. See you all in the shop this April and if not -- Have fun out there!